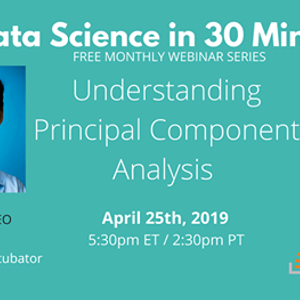 Join The Data Incubator and Julia Silge, Data Scientist at Stack Overflow, for the next installment of our free online webinar series, Data Science in 30 Minutes: Understanding Principal Component Analysis Using Stack Overflow Data. 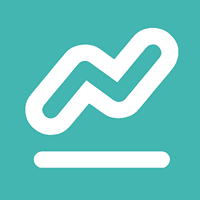 Abstract: Principal component analysis (PCA) is a powerful approach for exploring high-dimensional data, but like most machine learning algorithms can be challenging for learners to understand. 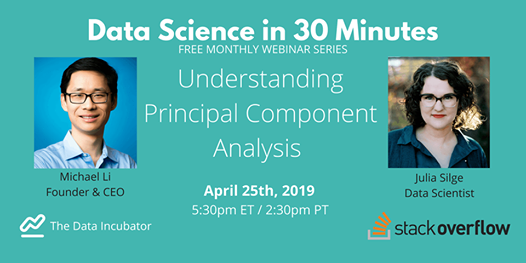 In this webinar, we will walk through a practical and interactive explanation of what PCA is and how it works. As a case study we’ll explore a domain that many who work with data are familiar with: programming languages and technologies, as measured by traffic to Stack Overflow questions. We will explore how interactive visualization gives us insight into the complex, real-world relationships in high-dimensional datasets. We will also discuss how data is used at Stack Overflow and life as a data scientist there. Julia Silge is a data scientist at Stack Overflow, with a PhD in astrophysics and an abiding love for Jane Austen. Julia worked in academia and ed tech before moving into data science and machine learning. She is the author of Text Mining with R, with her coauthor David Robinson. She enjoys making beautiful charts, coding, text mining and NLP, and communicating about technical topics with diverse audiences. Michael Li founded The Data Incubator, a New York-based training program that turns talented PhDs from academia into workplace-ready data scientists and quants. The program is free to Fellows, employers engage with the Incubator as hiring partners. Previously, he worked as a data scientist (Foursquare), Wall Street quant (D.E. Shaw, J.P. Morgan), and a rocket scientist (NASA). He completed his PhD at Princeton as a Hertz fellow and read Part III Maths at Cambridge as a Marshall Scholar. At Foursquare, Michael discovered that his favorite part of the job was teaching and mentoring smart people about data science. He decided to build a startup to focus on what he really loves. Michael lives in New York, where he enjoys the Opera, rock climbing, and attending geeky data science events.